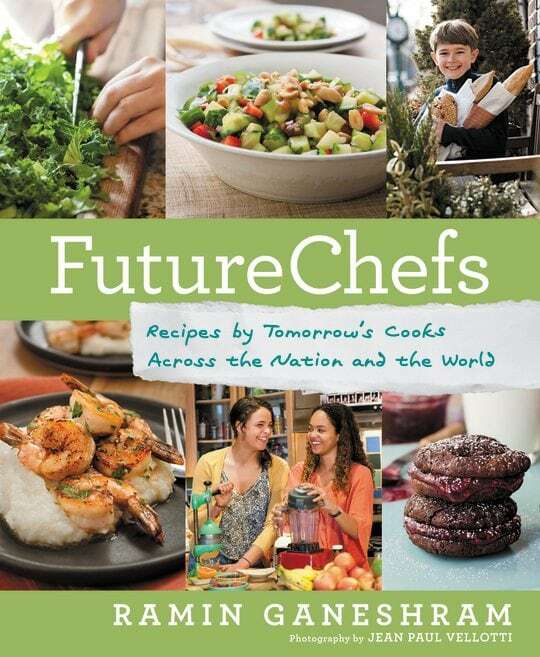 I guess I should tell you the reason I’m so excited… my son Brooks (RecipeBoy) is featured in the book! It’s also a terrific read- featuring young foodies (ages 5 to 18) from all over the world. Inspirational stories of what these kids are doing in their local communities and across the web are included, as well as delicious recipes too! Myka Smith Jackson- age 10 (Lexington, Kentucky): Myka was the Kentucky winner of Epicurious.com’s Healthy Lunchtime Challenge- the prize being a trip to the White House! She’s a fan of touring her local farmer’s markets to look for new things she hasn’t tried before. 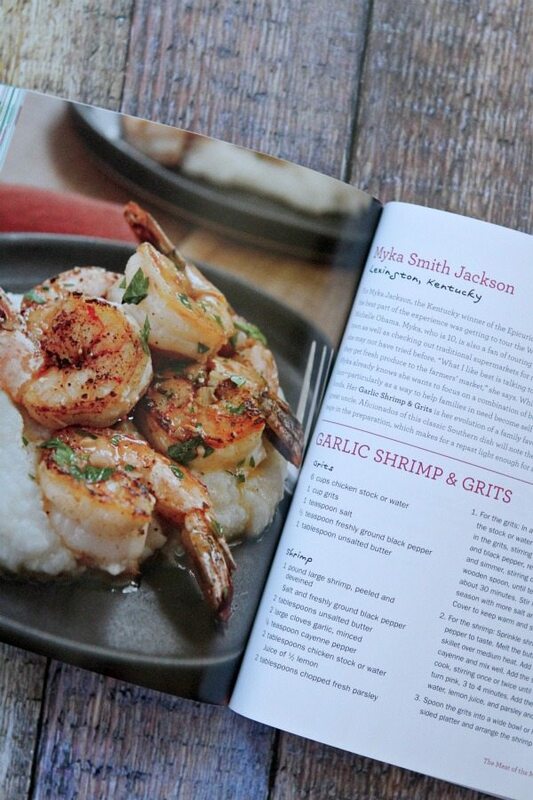 Her Garlic Shrimp & Grits recipe is her version of a family favorite traditionally prepared by her great uncle. 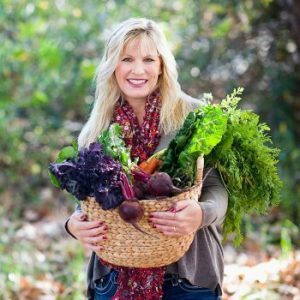 Amber Kelley- age 10 (Woodinville, Washington): With two parents who are wellness coaches, Amber has never eaten anything but clean, healthy food. She started an online cooking show featuring recipes she thinks other young people might be encouraged to try. She wants to show other kids that it’s cool to be healthy and that there are always healthier options that are just as yummy. 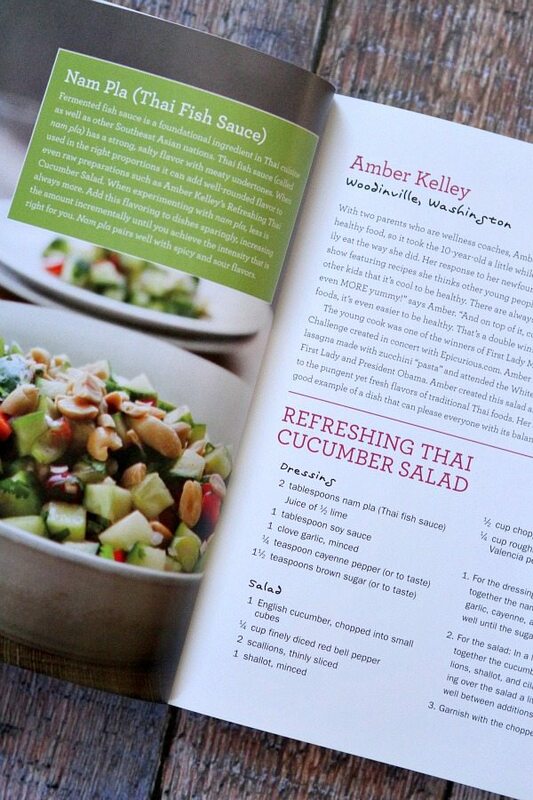 Amber created this Refreshing Thai Cucumber Salad as a way to introduce other people her age to the pungent yet fresh flavors of traditional Thai foods. You can visit Amber on her food blog- Cook With Amber. Nathan Bailey- age 15 (Reading, England, United Kingdom): Nathan won his first cooking competition for kid-chefs in 2011. He acts as a sous chef for his mother (a UK cooking personality) helping out in cookery demonstrations that his mom runs for those with celiac disease and others who want to learn about healthy gluten-free foods. 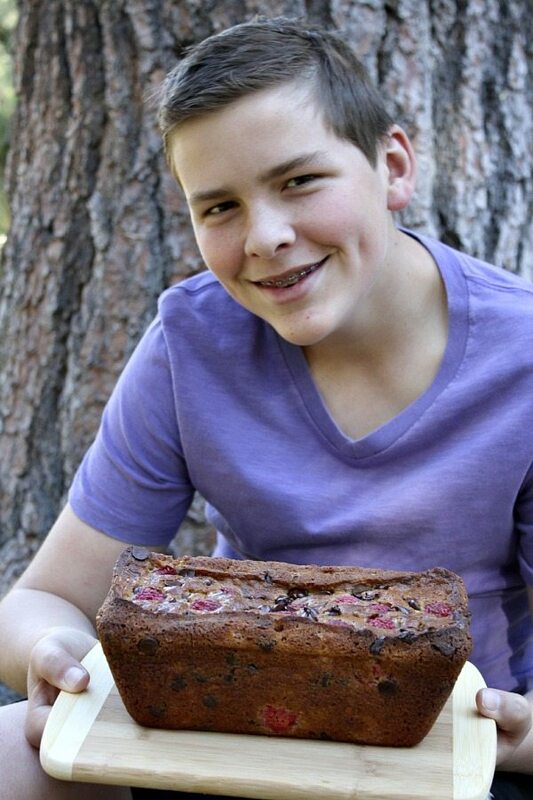 He adopted a gluten-free lifestyle when he was 11, started a gluten-free cooking blog and hopes to one day write a gluten-free cookbook for teenagers. 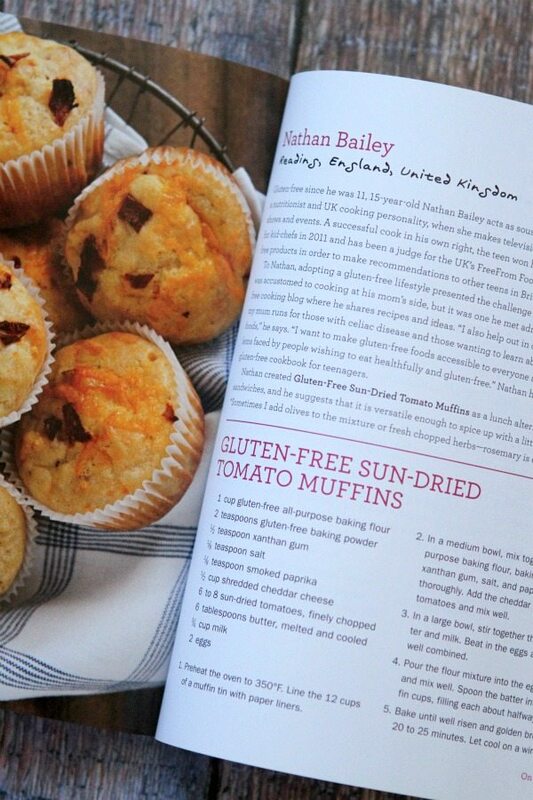 Nathan created these Gluten-Free Sun-Dried Tomato Muffins as a lunch alternative to sandwiches. Sasha Meshcherekova- age 14 (Vancouver, British Columbia, Canada): Sasha enjoys bonding with her friends over cooking. She attended a culinary camp last summer, learning advanced techniques and flavor combinations. 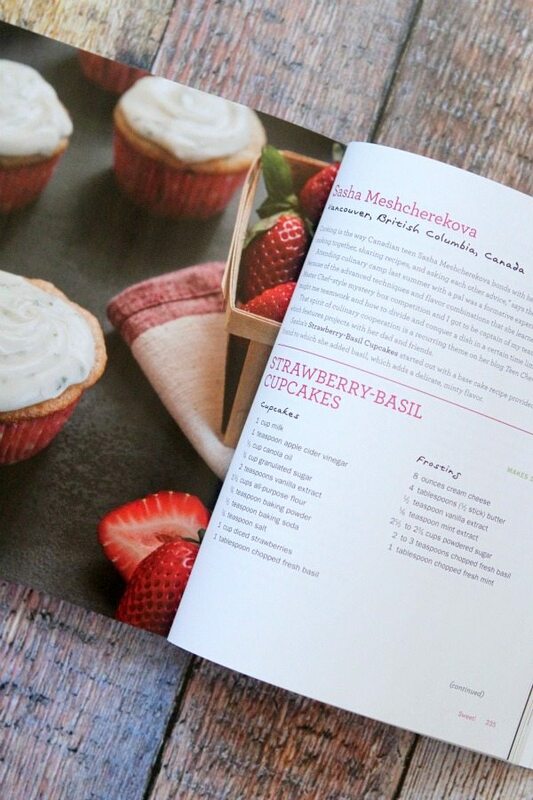 She created these Strawberry- Basil Cupcakes by using a base cake recipe from a foodie friend, adding basil make things interesting! I would love to win this wonderful cookbook. I love seeing kids cook from scratch. I did this when I was a child with my mother and enjoyed it so much. These amazing young chefs are wonderful. Their ideas are interesting and refreshing. I would love to win this cookbook. Thanks for the chance. I would love to have this lovely cookbook. These young people are so talented. Thanks for the chance.